Summary: Perennial New York Times and nationally bestselling author and acclaimed multiple–prize winner Laura Lippman delivers a brilliant novel about a woman with a secret life who is forced to make desperate choices to save her son and herself. When Hector Lewis told his daughter that she had a nothing face, it was just another bit of tossed-off cruelty from a man who specialized in harsh words and harsher deeds. But twenty years later, Heloise considers it a blessing to be a person who knows how to avoid attention. In the comfortable suburb where she lives, she's just a mom, the youngish widow with a forgettable job who somehow never misses a soccer game or a school play. In the state capitol, she's the redheaded lobbyist with a good cause and a mediocre track record. But in discreet hotel rooms throughout the area, she's the woman of your dreams—if you can afford her hourly fee. While I haven't read everything that Laura Lippman has every written (because it's a heck of a lot of books), I do consider myself a fan. I have enjoyed both her Tess Monaghan books and her stand-alones, so there was never any doubt in my mind that I would pick up her latest novel AND WHEN SHE WAS GOOD. What did catch me by surprise was that AND WHEN SHE WAS GOOD wasn't really a mystery or suspense novel -- so I didn't want to use it for Mystery Monday. Rather, it was a story about a strong-willed woman and her secrets. 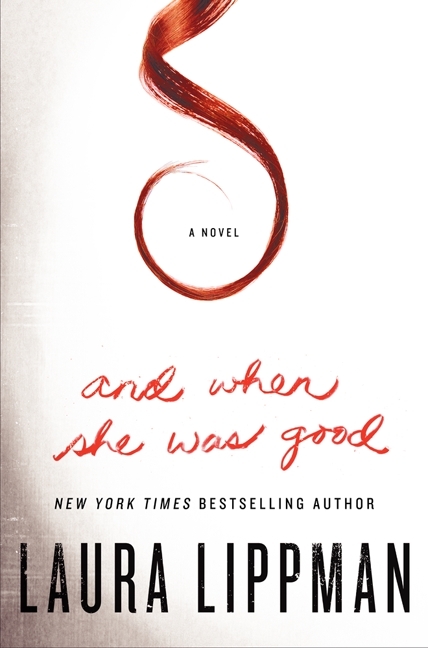 AND WHEN SHE WAS GOOD tells the story of Heloise Lewis, a single, working mom who lives in suburban Maryland, who is just trying to do her best for son Scott. Heloise comes across as a grieving widow and dedicated mom who also has a very successful career as a lobbyist. However, things aren't what they seem when it comes to Heloise. First of all, she runs a successful prostitution ring. Secondly, she's not really a widow. Thirdly, her son's father is in jail for murder because Heloise secretly informed the police about his guilt. Needless to say, she has a lot of secrets and the list of deceptions could on and on. But one's things for sure, Heloise tries to keep a low profile, both personally and professionally, so she can keep herself and her son safe. And then, Heloise discovers that her secret life might not be so secret. When another local madame is found dead, the police want to talk to Heloise to see if she knows anything. In addition, her loyal accountant is suddenly asking some very interesting (and pointed) questions; and her friend who is a policeman tells her that she needs to be on the lookout for danger. And last but certainly not least, she learns that her son's father (who doesn't even know he has a son) might be released from prison. Needless to say, Heloise's already complicated life is becoming even more complicated. The real question is: Can Heloise reinvent herself once again before all of her secrets catch up with her? AND WHEN SHE WAS GOOD definitely had a different feel to me than Lippman's other books; however, I still really enjoyed it. I appreciated that there were still elements of crime and suspense woven into the story, and I liked the plot twists and even the ending.What I really appreciated, though, was how this novel featured a very strong character in Heloise. Goodness knows, Heloise had a rough childhood and an even rougher adulthood; however, she showed that she was a survivor. I enjoyed how she continually had to reinvent herself, and it was through her intelligence and wits that she was able to pull off everything. I also really appreciated that Lippman focused on Heloise's love of her son as the reason why she was driven to so much deception. Talk about the power of motherly love! Heloise wasn't a bad person, or at least she didn't see herself that way (nor did I); however, she felt as if she were forced into many of her actions because of her desire to keep her son safe. Sadly, she really didn't have a lot of choices available to her without family support and an education. While Heloise's behavior might have been a drastic example of the lengths a mother will go to protect her child, I do think many women will be able to relate to her and her feelings toward Scott. I was a little surprised that I couldn't find a reading guide for AND WHEN SHE WAS GOOD because I do think it would make for an interesting book to discuss. Not only is Heloise a fascinating character, but there are some other themes which warrant further discussion. Some of the topics you might want to explore include parent/child relationships, motherly love, sacrifice, deception, lies, secrets, good versus evil, prostitution, lobbying, and other moral ambiguities. AND WHEN SHE WAS GOOD was definitely an entertaining read for me as well as one that caused me to think. I highly recommend it to fans of Lippman and readers who enjoy in-depth character studies of strong women. This one really sounds good! I think I'm going to read it ! Holy cow, Heloise sounds like a piece of work! This sounds really good to me! maybe they will add discussion questions to subsequent editions or the paperback. I was given this one unexpectedly...but now I'm thinking it may not be best form mom who is the mystery gal. I am a big fan of Laura Lippman and am really looking forward to getting a hold of this book! I have read one of Lippman's standalones and it was so good that I added this one to my list. It sounds very interesting and like a great discussion book. I like Lippman too and had no idea this wasn't mystery. Now I'm looking forward to this even more.